To support Wartburg College efforts toward sustainability, the 2018-19 academic catalog is available as an interactive online source for curriculum information. While it is the responsibility of students to know and observe all college policies and procedures, students can print the pages and information most relevant to their program. In the future, Wartburg will offer students the option to create their own portfolio of academic information which can also be accessed through a mobile app. Prospective students will have access to the same catalog features to assist them in planning their education. The 2018-19 online academic catalog is the official source for Wartburg academic programs and courses. Students are encouraged to utilize the catalog along with My.Wartburg (and the Advising Worksheet) to plan their path to graduation. The online academic catalog offers many features to assist students, including advanced search options, intuitive navigation, and easier access to Wartburg's main web pages. Students are encouraged to meet with their academic adviser at least once each term and reference the catalog under which they enrolled as degree-seeking. The online academic catalog will be published annually, allowing changes to programs and courses to be more visible for each new academic year. The 2018-19 schedule of classes is available on My.Wartburg. Begin your exploration of the online academic catalog by selecting the links on the left. The online academic catalog is produced by the Dean of Faculty Office and the Registrar's Office. Students are expected to meet the program and degree requirements under the catalog year in which they are first enrolled as degree-seeking, provided that they complete graduation requirements within a continuous period of no more than eight years. See Catalog Year and Degree Requirements for more information. 2017-2018 Academic Catalog (Archived) - Select from the drop-down menu in the top right corner of the screen. 2016-2017 Academic Catalog (Archived) - Select from the drop-down menu in the top right corner of the screen. 2015-2016 Academic Catalog (Archived) - Select from the drop-down menu in the top right corner of the screen. 2014-2015 Academic Catalog (Archived) - Select from the drop-down menu in the top right corner of the screen. 2013-2014 Academic Catalog (Archived) - Select from the drop-down menu in the top right corner of the screen. 2012-2013 Academic Catalog (Archived) - Select from the drop-down menu in the top right corner of the screen. 2007 or earlier catalogs: Contact the Registrar's Office. 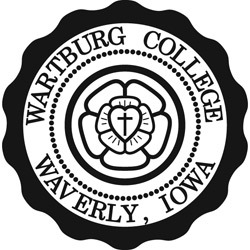 Wartburg College reserves the right, without notice, to modify the requirements for admission or graduation; to modify the courses of instruction or programs of study; to change tuition and other fees; to refuse admission or readmission to any student at any time; or to alter any portion of this catalog and policies or procedures referred to herein. Students are responsible for inquiring about changes in this catalog or college policy. Wartburg College is an affirmative action/equal opportunity employer.